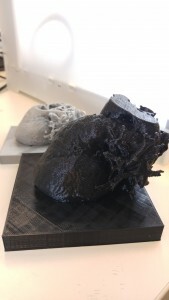 Why is printing a 3D Heart from a patient’s MRI or CT scans useful? 3D Printing can allow surgeons to design patient-specific surgeries which could lead to smaller incision sites, better access, reduced surgery time and if a graft or device is being inserted, it could lead to a better fitting model/device. Patient-specific surgeries are very useful in the congenital heart disease community. Patients with congenital heart disease have unique anatomies and complex physiological systems. Surgical planning is often critical to a successful surgery in this patient population. 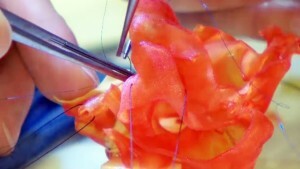 Surgeons can even practice surgeries on the 3D printed models. The NIH has created a library of different medical models. These models will be able to make large morphological comparisons possible. 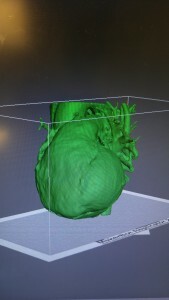 For my semester project, I was able to successfully print a heart from MRI images using Osirix and Meshmixer. Here is a picture of the final project. 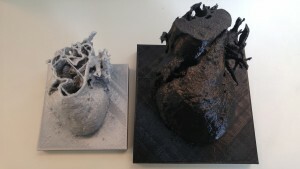 In the future, I hope to write a full tutorial of how to print the internal structures of the heart and how to optimize the printing supports in an extruder print setting.